No other Double Ended HPS lamp on the market has gone through the rigorous design and life testing standards like the EYE HORTILUX DE. Thousands of hours of testing this lamp ensures you are receiving a quality and reliable lamp which will operate with consistent performance on any electronic ballasts. EYE HORTILUX DE lamps are the only DE lamps designed and manufactured in the USA. Double Ended (DE) HPS grow lamps are typically used by commercial growers with large spaces and high ceilings. DE HPS grow lights produce higher intensities of light due to the design, construction and internal pressures of the arc tube (light generating source). The physical design and shape of the DE grow bulb provides a consistent positioning of the light source allowing reflector manufacturers to optimize the focus and footprint of light over the plant canopy. What Makes the Hortilux DE different? - Produces higher yields than Single Ended HPS lamps. - Reduces lamp replacement costs. - Maintains results after multiple growth cycles. - Better spectral balance for increased plant response and accelerated growth. - Outperforms competitive DE lamps in plant quality and yield. - Exclusive EYE HORTILUX spectrum. - Compatible with e-Ballasts that operate at or above 100 kHz. - Unique TWIN COIL SUSPENSION™ (TCS™) support frame allows for expansion and contraction of the arc tube during operation*. 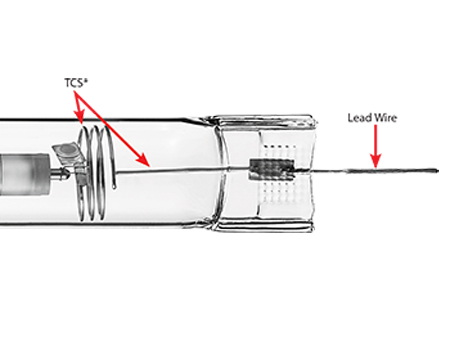 - Patent pending lead wire design provides safer, more reliable connection within DE sockets. - Provides 1950 μmol when operated at 1000w. - Provides 2100 μmol when operated at 1150w. - Meets Federal EPA standards as non-hazardous waste. - Operated and tested before packaging. - Glove included with lamp for safe handling.